50 years, anthropology photographer, culture, art, nature, society. His interest in photography and subsequent career took root during the years 1983 to 1987 while living on Levanzo, a small island with 100 inhabitants in the Egadi archipelago west of Sicily . For four years he worked alongside the islands fishermen takong pictures - the experiences, dramatic atmosphere and respect for the breathtaking but often unforgiving elements taking expression in photographs of nature, art, culture and society. In 1988 he relocated to Palermo to pursue a career as a professional photographer. A major development came in 1991 when he was appointed as photographer to the renowned Theatre du Soleil (d Arianes Mnouchkine), a prestigious role allying him to the legendary Martine Frank and Henry Cartier Bresson (Mgnum) and Michelle Laurant (GAMMA). He continues in this role to this day, having exclusive photographic rights with the theatre. 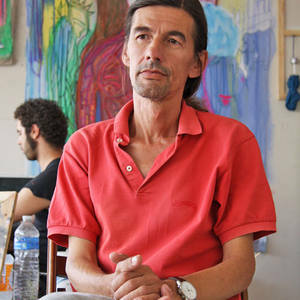 His work has been distributed internationally and he has exhibited widely, including in France , Germany , Holland , Italy and Tunisia . He has collaborated and had work published in a variety of international magazines. This year he published the book "The tuna fishermen of Favignana," a book on tuna fishing in Sicily and he is making others books about Sicily and Theatre du Soleil of Paris. He is reporter and all around us is interesting for him, evvery moment, every time.